The Christmas market in Prague is a must do during the festive season. The two main squares (Old Town Square & Wenceslas Square) are transformed into a winter wonderland that St Nickolas himself would be proud of, colourful wooden huts selling handmade Christmas decorations, stocking fillers such as handmade wooden toys, Bohemian Crystal, puppets and dolls, ginger breads and candy chains, keep your hand warm with a mug of hot cider/wine and a bag of roasted chestnuts as you wander around looking for the perfect gift. 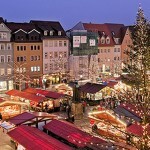 The Christmas market is a very popular event attracting thousands people from around the world, all the gay bars and clubs have events and parties going on so don’t forget to take a look at their websites in the bars section of the guide. It’s important to find the right hotel for your trip keeping you in the heart of all the fun, as you can see from the map below the gay scene is a little spread out, so we have chosen hotels with a good rating that keep you around the old town and within walking distance of some of the gay bars, and of course next to the Christmas market.